These were commonly found on subway platforms, in pharmacies, and at the 5-and-10. 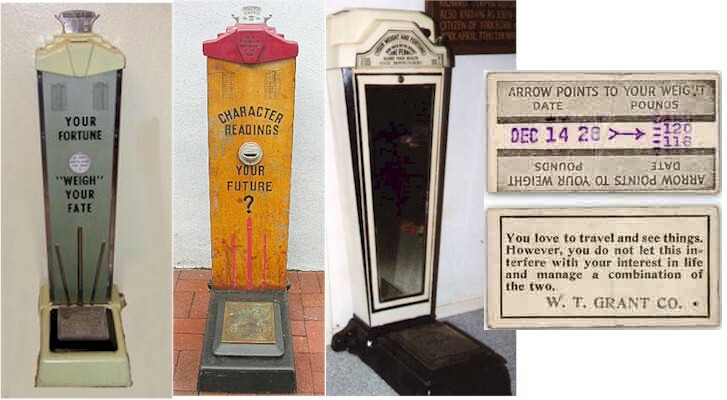 Some displayed your weight and fortune in a window, while others spat out a printed card. I always think of the 'Twilight Zone' episode with William Shatner in it, feeding the penny fortune teller with the devil on top, in that small town diner. It wasn't a scale, but, still enjoyed watching it. I remember the scale in the W.T. Grant on Jamaica Avenue, Jamaica, NY back in the 50s and 60s.